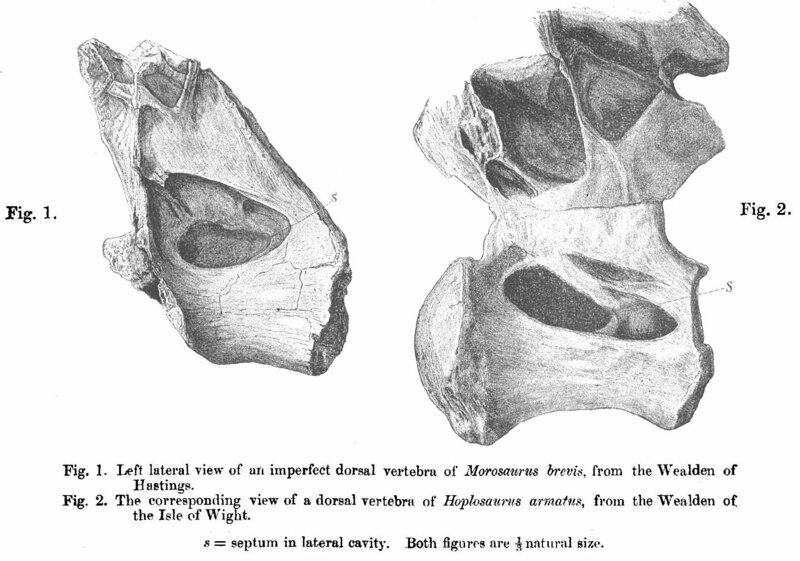 Matt’s drawn my attention to a bizarre fact: despite 17 separate posts about Xenoposeidon on this blog (linked from here and here), we’ve never shown a decent scan of Lydekker’s (1893) original illustration of NHMUK PV R2095, the partial mid-to-posterior dorsal vertebra that since Taylor and Naish (2007) has been the holotype specimen of Xenoposeidon proneneukos — and since Taylor (2018) has been known to represent a rebbachisaurid. Well, here it is at last! That’s Xeno on the left, of course. 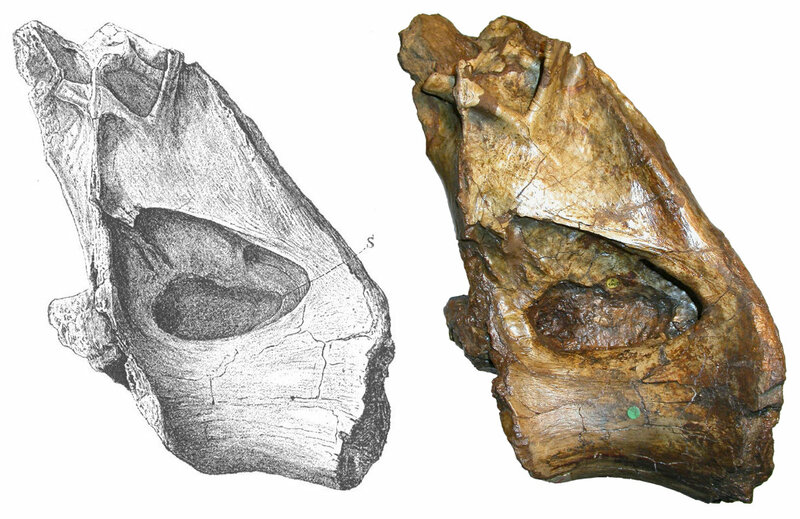 On the right, we have one of the various Wealden titanosauriform dorsal vertebrae that were constantly getting referred back and forth between taxa in the late 1800s. I think it might be one of the NPMUK PR R90 vertebrae, perhaps the one that, for disambiguation purposes, I’ve informally named R90a. The main differences here seem to pertain to how Lydekker and I perceived “lateral”. I think he has the vertebra rotated slightly away from us, so that it’s leaning into the page, and that’s why the centrum appears slightly taller and the arch slightly less tall than in my photo. He seems to have a bit more matrix stuck on the front of the centrum — perhaps because slightly more prep has been done since 1893 — but, worryingly, slightly less bone around the cotyle. I think that can only be illustration error, since that bone is definitely there. Lydekker, R. 1893. On a sauropodous dinosaurian vertebra from the Wealden of Hastings. Quarterly Journal of the Geological Society, London 49:276-280. 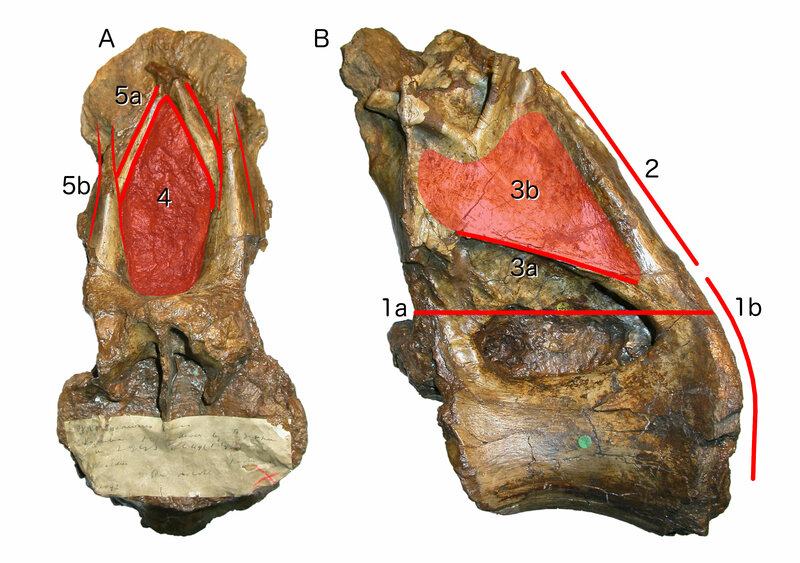 Our Barosaurus preprint has risen from the grave! Long-time SV-POW! readers will remember that three years ago, full of enthusiasm after speaking about Barosaurus at the Edinburgh SVPCA, Matt and I got that talk written up in double-quick time and had it published as a PeerJ Preprint in less than three weeks. Very quickly, the preprint attracted substantive, helpful reviews: three within the first 24 hours, and several more in the next few days. This was great: it gave us the opportunity to handle those review comments and get the manuscript turned around into an already-reviewed formal journal submission in less then a month from the original talk. So of course what we did instead was: nothing. For three years. I can’t excuse that. I can’t even explain it. It’s not as though we’ve spent those three years churning out a torrent of other awesome papers. We’ve both just been … a bit lame. Anyway, here’s a story that will be hauntingly familiar. 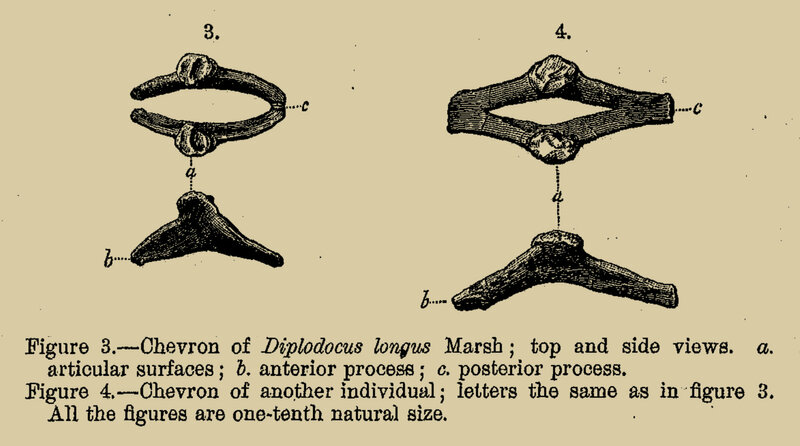 A month ago, full of enthusiasm after speaking about Barosaurus at the Liverpool SVPCA, Matt and I found ourselves keen to write up that talk in double-quick time. It’s an exciting tale of new specimens, reinterpretation of an important old specimen, and a neck eight times as long as that 0f a world-record giraffe. Taylor and Wedel 2016: Figure 3. 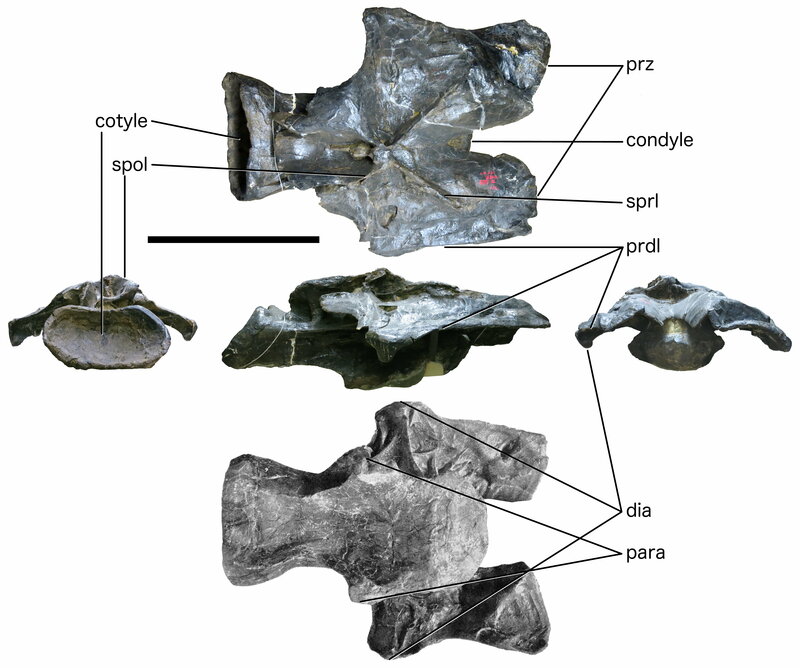 Barosaurus lentus holotype YPM 429, vertebra R, C?15. Top row: dorsal view; middle row: posterior, right lateral and anterior views; bottom row: ventral view, from Lull (1919: plate II). Note the apparently very low, undivided neural spine at the intersection of the SPRLs and SPOLs, forward-shifted neural arch, broad prezygapophyses, broad, wing-like prezygadiapophyseal laminae, and great width across the diapophyses and across the parapophyses. Abbreviations: dia, diapophysis; para, parapophysis; prz, prezygapophysis; prdl, prezygadiapophyseal lamina; spol, spinopostzygapophyseal lamina; sprl, spinoprezygapophyseal lamina. Scale bar = 500 mm. A big part of the purpose of this post is to thank Emanuel Tschopp, Mark Robinson, Andy Farke, John Foster and Mickey Mortimer for their reviews back in 2013. I know it’s overdue, but they are at least all acknowledged in the new version of the manuscript. Meanwhile, I will finally be working on handling the reviews of this other PeerJ submission, which I received back in October last year. Yes, I have been lax; but I am back in the saddle now. Like all the other groups, ours was tasked with making a presentation to the plenary session, taking questions and feedback, and presenting a version 2 on the final day. Here’s the title page that I contributed. This document reflects the combined input of the authors listed here (in alphabetical order by last name) as well as contributions from other OSI2016 delegates. The findings and recommendations expressed herein do not necessarily reflect the opinions of the individual authors listed here, nor their agencies, trustees, officers, or staff. Is this the moral-dimensions paper I would have written? No, it’s not. Being a nine-way collaboration, it pulls in too many directions to have as clear a through-line as I’d like; and it’s arguably a bit mealy-mouthed in places. But over all, I am pretty happy with it. I think it makes some important points, and makes them reasonably well given the sometimes clumsy prose that you always get when something is written by committee. Anyway, I think it’s worth a read. By the way, I’d like to place on record my thanks to Cheryl Ball of West Virginia University, who did the bulk of the heavy lifting in putting together both the presentation and the paper. While everyone in the group contributed ideas and many contributed prose, Cheryl dug in and did the actual work. Really, she deserves to be lead author on this paper — and would be, but for the alphabetical-order convention.